PYONGYANG, North Korea (AP) — AP bureau chiefs Eric Talmadge in Pyongyang and Foster Klug in Seoul report on the two countries’ views of this week’s summit between North Korean leader Kim Jong Un and South Korean President Moon Jae-in. But North Korea’s packaging of the first images of Moon’s visit to its capital this week, as broadcast on state television a full day after the rest of the world saw them, offers some guidance — and some important insight. The official North Korean narrative is all about ethnic pride, unity and how Kim is paving the way for a Korean-led solution to the decades-old problem of how to bring peace to the peninsula. “Korean-led” is the key point here. In the 30-minute edit of Moon’s first two days as Kim’s special guest, there was no mention of the United States, or denuclearization, or Trump. A commentary run by the ruling party newspaper on Tuesday, the day Moon arrived, took care of that — blaming Washington’s “stubborn” and “gangster-like” demands for the North to unilaterally give up its nuclear weapons as the sole cause of the breakdown in U.S.-North Korean talks. In North Korea, the day-to-day status of negotiations with Washington isn’t what people care about. Or, at least, it’s certainly not what they are supposed to be fretting about. Whatever happens down the road between Kim and Trump, or Kim and whoever follows Trump, since North Korean leaders tend to outlast American presidents, this is to be regarded as a moment of triumph. Coming so soon after last week’s lavish celebration of North Korea’s 70th birthday, Moon’s visit is being cast as something of a tribute, a show of respect. 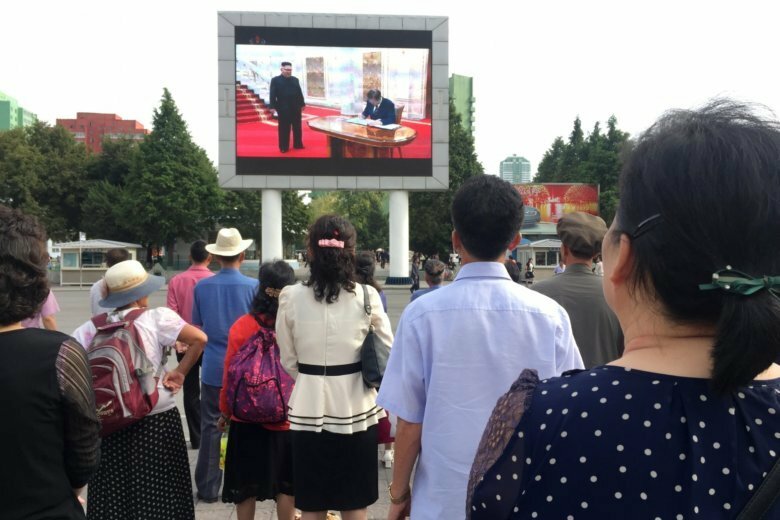 When the first images of Moon came on the TV screens, people across Pyongyang, the capital, stopped what they were doing to watch and savor the moment. The underlying message being delivered by the state propaganda machine is clear — it was the wisdom of Kim that has opened up the way to a brighter future and it is only the stubborn interference of imperialists and reactionaries that can stand in the way. For most North Koreans, that’s probably a comforting and hopeful thought. It is, course, also nothing if not familiar. It has pretty much always been North Korea’s official message to its people. Of course, the North can’t simply ignore the big, pressing issues that loom before it. In contrast to the optimistic message being fed to the masses, there has been a feeling of tension in Pyongyang these days. Security has been tight, well before Moon’s arrival, and officials are enforcing more restrictions on the ability of foreign journalists to talk to people on the street and for foreign diplomats to move around outside the capital. The North Korean leadership is well aware that the stakes are high, and that a breakdown in talks with Washington could have dire consequences. Though it wasn’t packaged that way for the domestic audience, Kim’s meeting with Moon could just as easily be seen as a big message for Trump, one that was perfectly in keeping with what North Korea has been proposing since the Trump summit ended. The Korean leaders’ surprisingly substantive summit announcement is a huge step toward a durable peace on the Korean Peninsula — and a Nobel Peace Prize for Kim Jong Un and Moon Jae-in. No, no, it’s the death rattle of the once formidable U.S.-led pressure campaign against the North as it crumbles under the false optimism of inter-Korean engagement. Or maybe it’s just the latest empty promise from a North Korean regime famous for backstepping? Talmadge has been the AP’s Pyongyang bureau chief since 2013. Follow him on Twitter and Instagram: @EricTalmadge.